Master Key systems offer control over the movement of people within a building or buildings to provide security and accessibility to the customer for their key holders, tenants or occupiers. Designs can be either on an open section key or on a restricted security key, registered to stop unauthorized duplication of keys. 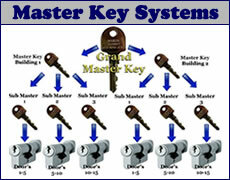 Britannia Master Locksmiths recommend using restricted security key system as this is more secure. Britannia Master Locksmiths fit Master Key systems to domestic premises, multi tenanted buildings and flats, schools, colleges, universities, health authorities, council and local authorities, retail and offices or any business with multiple sites. We can design Master Key systems to cylinder operated locks both euro and oval, padlocks, any combination of these locks. Whether your need is a single security lock for your own front door, or a large establishment or company with multiple sites Admiral Security can help. This involves each lock having its own individual key which will not operate any other lock in a building or buildings, but where all locks can be operated by a single key, usually held by a owner, a warden, someone in security, a nominated key holder for the premises... this key is the MASTER KEY.